We are proud to say that one of our own SKG writers, Vince Lanci was interviewed on The Street by Daniela Cambone as part of Kitco's “Gold Outlook” series done annually. We’ve added a couple charts illustrating Vince's point exclusively for the Marketslant community. Enjoy! Something very telling has happened over the last three days in the gold market. "The last three days have reconfirmed my commitment for a much higher gold price in 2018. We are making higher lows for the year - the recent behavior made me nervous, but something very telling happened in the last three days," says longtime commodities trader Vince Lanci, founder of Echobay Partners. [SKG EDIT- Here is to what Vince was referring. 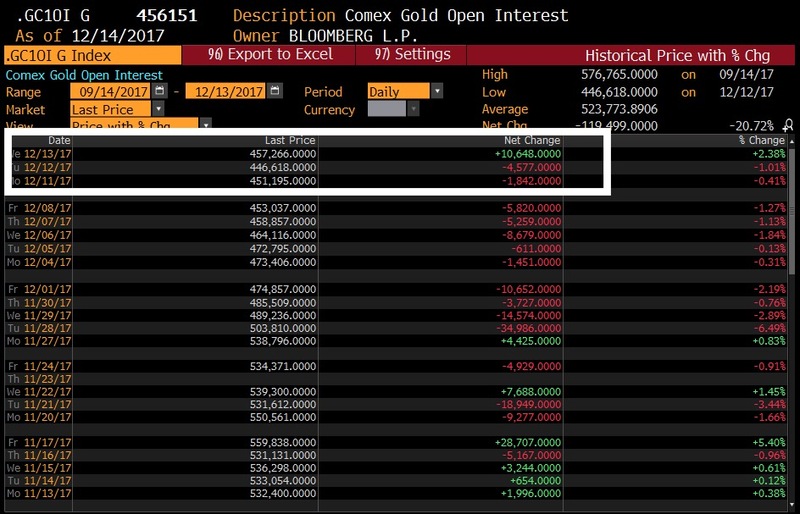 Note the change in open interest during the 3 days corresponding to the white box in this daily chart of February Gold. We would add this is a common candlestick configuration at reversal points as well. Lanci noted he could see the metal hitting $1,700 an ounce or higher in 2018. If correct, his forecast would be an over $450 rally from the current level of $1,250 an ounce. "On Tuesday we had a short covering rally. And Wednesday there was a 10,000 contract increase in December - that's very unusual, that is an over 2.3% increase in open interest," Lanci explained. The point Lanci stresses is that gold is now back in a "safe area" between $1,250-$1,275 an ounce. "The $1,700 call I believe in is going to come to fruition- [if gold gets] above $1,275 I will double down on a momentum bet." Gold prices have dropped about 3% over the last month as investors bought more stocks in light of Trump's tax plan nearing completion. They hit a short-term bottom of $1,237 an ounce on Dec. 12. This expert take on gold brought to you by www.kitco.com. Have something to say? Let us know. Contacts will be kept confidential.